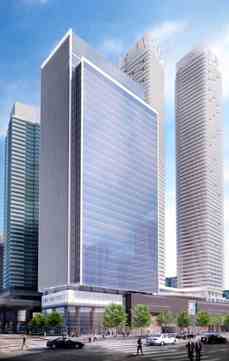 35-storey office tower and 62 and 66-storey residential condominium towers at 1 York and 90 Harbour Street respectively. One York Street aims to establish a new standard for environmentally sustainable development by pursuing LEED® Platinum certification under the internationally-accepted Leadership in Energy and Environmental Design program. The LEED® rating system recognizes excellence in the design, construction and operation of green buildings. The progressive design of the new tower incorporates state-of-the-art technology in both building automation systems and tenant environments, including elements such as a raised floor HVAC system to provide individual temperature control and greater access to fresh air, constant air-quality monitoring and occupancy sensors for controllable lighting. The building will also be connected to the Enwave deep lake water cooling system which uses water from Lake Ontario for air-conditioning. 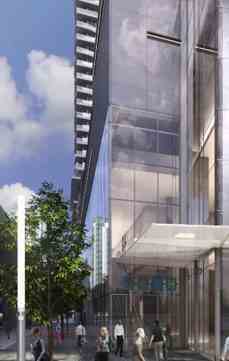 A 31-storey office tower at 1 York Street. Harbour Plaza Residences will be located right next door to 1 York, the much-anticipated commercial building currently under construction that will house over 800,000 sq. ft. of business-related space. One York Street will be part of a larger mixed-use development encompassing approximately 2 million square feet of density occupying a two-acre site. The office tower will sit atop a four- storey podium containing approximately 200,000 square feet of retail space. Builders : Menkes Developments Ltd.
1 YorkBuilder(s): Menkes Developments Ltd.